Author: Mario Krämer. Series edited by: Trutz von Trotha †, Rainer Geißler. 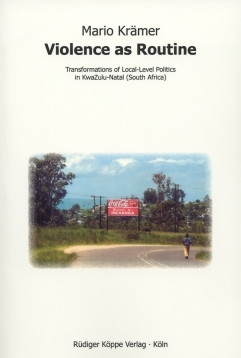 This book examines local-level politics and violent conflict in KwaZulu-Natal, South Africa. It is estimated that about 20,000 people were murdered in the course of violence and more than 500,000 people became refugees since the 1980s. Despite the claims of political leaders that violent action has finally subsided and KwaZulu-Natal is a peaceful place to live nowadays, a substantial number of people were killed in violent conflict after the democratic transition in 1994. The author proposes two arguments. First, violent conflict in the post-apartheid era is characterised by a disjunction between centre and periphery, that is, violent dynamics on the ground are dissimilar to conflicts between political parties (African National Congress versus Inkatha Freedom Party) on the provincial level. This disjunction is not equivalent to autonomy but rather signifies a changing process of linkage and decentralisation between the national/provincial level on the one hand and the local on the other. Local dynamics are not merely a mirror image of political processes in the centre: the latter are subject to local interpretation and can be modified according to local interests. Secondly, the disjunction comes along with self-sustaining dynamics of violent conflict: violence creates institutions and power relations which in turn reproduce violent action. 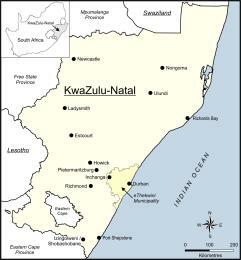 Hence, local-level politics in KwaZulu-Natal constitute an emerging form of political power which differs considerably from the democratic scheme it should correspond to after the political transition in 1994. This book draws on a variety of methodological tools: in the course of one year of fieldwork in KwaZulu-Natal approximately 200 interviews were conducted with people affected by and actively participating in violent conflict. Furthermore, the informal, un- and semistructured interviews were cross-checked with personal observations on the ground and a variety of written sources such as newspaper reports, violence monitoring reports and (secret) police files. Statistics by the eThekwini Municipality, Statistics South Africa, the Independent Electoral Commission and the South African Police Services (SAPS) provided quantitative data on crucial economic, social and political issues. Mit der „political rivalry thesis“ wird das hohe Ausmaß an politischer Gewalt in der Provinz KwaZulu-Natal dadurch erklärt, dass sich die Rivalität zwischen den Eliten des African National Congress (ANC) und der Inkatha Freedom Party (IFP) bis in die Lokalpolitik fortsetzt. Der Autor hält diesen weitverbreiteten Erklärungsansatz für unvollständig und bevorzugt zwei alternative Argumente, um die Gewalt am Beispiel der Region Inchanga zu erklären. Dabei stützt er sich neben theoretischen Erkenntnissen der Gewaltforschung auf eigene empirische Untersuchungen aus der Zeit von April 2001 bis Januar 2002. Laut Krämer zeichnet sich seit Ende der Apartheid eine Trennung zwischen Zentrum und Peripherie ab („disjunction thesis“). Diese Trennung manifestiert sich in zeitlicher sowie inhaltlicher Hinsicht. Zudem hat Gewalt infolge von Racheakten und transformierter Machtbeziehungen, etwa durch Klientelismus sowie Klüngelei, eine Eigendynamik entwickelt und als Routine Eingang in die Lokalpolitik gefunden. In seinem Ausblick bewertet Krämer die Möglichkeit, Gewalt durch lokale Institutionen oder staatliches Durchgreifen eindämmen zu können, tendenziell negativ. Er sieht die Gewalt in dem Wechselspiel von Eskalation und Rückgang als Normalität in der Provinz KwaZulu-Natal verankert. Significantly, such violence calls into action today the higher echelons on a provincial level of the parties who claim the allegiance of one or the other side involved. However, as Krämer shows, such interventions are ineffective at best, in particular since the dynamic of violence also feeds on the distance from the power centres and the chances this offers to strongmen to assert themselves and their agendas. Such dynamics as well as the spread of insecurity and above all a pervasive quest for revenge among warring sections have sent violence in In­ changa into a spiralling process of growing intensity several times. Unsurprisingly, the conclusions Krämer draws on the possibilities of resolving situations such as prevail in Inchanga are anything but optimistic. Rather, he concurs with Peter Waldmann in pointing to the far greater difficulties of creating lasting peace than prolonging war or generalised violence. A reconstruction of violent processes and their insertion into daily life as is presented here, can at least help us better to understand such dynamics.